gofanco 5-Port HDMI Switch 4K shares a single HDMI display between 5 HDMI source devices. Simply connect up to 5 source devices to the switcher and connect the switcher to the display (5 inputs & 1 output), then use the remote control or buttons on the switcher to transition between all of your favorite media devices! No need to purchase a display with 5 HDMI inputs! No need to get off your couch to switch sources! No need for the clutter of cables connected to your TV or display! Solve many problems with one device! 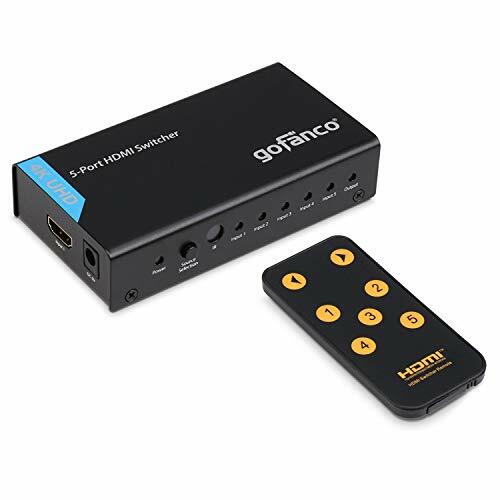 ✔ 5 PORT 4K HDMI SWITCHER - Connect and switch between 5 HDMI source devices on 1 HDMI display for smooth transitions between television, gaming, movies, etc. (5 inputs & 1 output) Ideal for the HDTV, monitor or projector with only a single HDMI port and reduces the clutter of cable connections to your TV or other display. ✔ ENJOY REMOTE or MANUAL SWITCHING - Remotely switch your HDMI sources (cable box, Blu-ray player, media player, etc.) without having to leave the comfort of your couch, with the included remote control. Manual switching from buttons on the device is also available. ✔ EASY INSTALLATION - No driver required; Sturdy metal enclosure provides durability and minimizes EMI/RFI noise interference. Power adapter is included and required. FCC, CE & RoHS compliant. We love our products and hope you will too. Our products are backed with a ONE YEAR limited warranty and experienced tech support team in Silicon Valley. If you have any questions or concerns regarding this product, please do not hesitate to contact us.